Tag line: "The Truth At Last? What Really Happened to The Hindenburg?" The Hindenburg, a German airship carrying 36 passengers and 61 crewmen, caught fire while attempting to dock in Lakehurst, New Jersey on May 6, 1937, resulting in the deaths of 35 people. It's a story that has all the makings of a great disaster film, but with one teensy little problem: the fire that destroyed the Hindenburg did so in less than a minute. How, then, would filmmakers fill the remaining 2 hours? As a result of several threats made against the German airship, Hindenburg, Franz Ritter (George C. Scott), a colonel in the Luftwaffe, is assigned to act as chief of security on the vessel's upcoming transatlantic flight. Far from enthusiastic about the assignment, Ritter nonetheless keeps a close eye on a number of potential suspects, including businessman Edward Douglas (Gig Young), who's been transmitting coded messages by way of the ship's radio room, and Boerth (William Atherton), a German soldier whose most recent romantic conquest was a woman the Nazis suspect of treason. 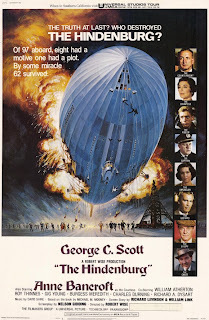 With the assistance of an undercover Gestapo agent named Martin Vogel (Roy Thinnes), Ritter carries on with his investigation, fighting the clock as the Hindenburg inches its way ever closer to both Lakehurst, New Jersey, and its date with destiny. There are things about Robert Wise's The Hindenburg that I definitely enjoyed, chief among them being the film's amazing cast. Several years removed from his brilliant turn as the title character in Patton, it was interesting to see George C. Scott parading around in a Luftwaffe uniform. Scott is one of those performers I always enjoy watching, and he does a fine job as the straight-laced military man who tolerates the Nazis only because he has to. In an early scene, Ritter is called into the office of Nazi Propaganda Minister, Joseph Goebbels (David Mauro), to discuss the upcoming mission on the Hindenburg. Scott questions whether or not the alleged plot is the work of the resistance. “There is no resistance movement”, Goebbels fires back. “That's reassuring”, Scott says, his voice dripping with sarcasm, “coming from the Minister of Propaganda”. Also strong, in a limited role, is Charles Durning as the Captain of the Hindenburg, a man who flat-out refuses to cancel the flight over a few silly threats, even when asked to do so by Lehman (Richard Dysart), one of the Hindenburg's managing partners. Also impressive were Anne Bancroft's disillusioned Countess and Thinnes's overzealous Gestapo agent. They, along with the rest of the cast, do an outstanding job of bringing their characters to life. Unfortunately, many other aspects of the film never do come alive, and there's barely enough story here to keep you interested over a 2+ hour run time. Ritter's investigation begins to lose steam about halfway through the film, and he shifts his attention from one person to the next with such regularity that I had a hard time keeping track of all the suspects. One or two attempts to introduce a little tension into the mix fall flat, like the scene with Boartt climbing onto the ship's wing to repair a torn section of canvas (I mean, history itself tells us the Hindenburg will make it all the way to Lakehurst in one piece). There are also a handful of sequences set in America, in which U.S. officials try to track down the source of the threats, that were completely unnecessary, adding nothing whatsoever to the story. The final 20 minutes of The Hindenburg are, indeed, tense, but in the end, there's far too much filler, and not nearly enough disaster, to make it a worthwhile film.